For most MBA aspirants, philosophy is a dreaded word. Most aspirants dislike philosophy-themed RC passages. I guess this comes from a (general) lack of interest in general reading, and more particularly, in reading philosophy. Immanuel Kant’s ‘Critiques of Pure Reason’ was the first philosophy book I read. At the time, I was in Class X. I understood most of the stuff; however, whatever I did not understand I simply ignored it by moving to the next line or paragraph or page or chapter! Last night, I came across this wonderful tech tool, which links ideas (topics) that you pick up on Wikipedia, including almost any random topic, to philosophy; this idea is being called the ‘Get to Philosophy Game’. For someone who loves philosophy, this wonderful tech tool has only reinforced my belief that philosophy is the mother of all thought and vice-versa. The object of the 'Get to Philosophy' game is to click on the first link in the main text of a Wikipedia article and repeat the process. As of May 26, 2011, 94.5% of all articles in the English Wikipedia lead eventually to the article Philosophy. The rest lead to an article with no wikilinks, links to pages that do not exist, or get stuck in loops. 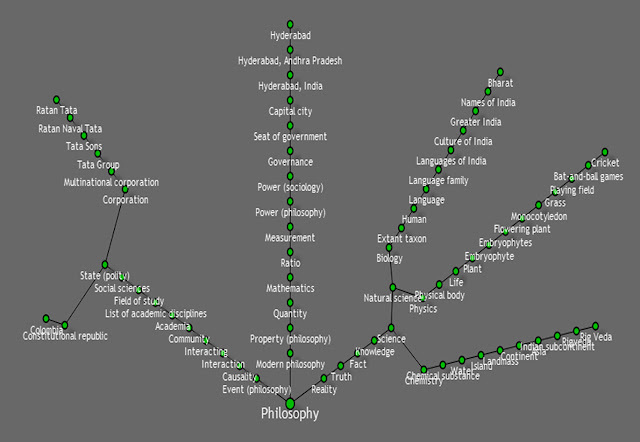 I tried this with some random words: Ratan Tata, Hyderabad, Bharat, Cricket, Rig Veda, Colombia. And yes, all of them linked back to philosophy! I found this tech tool here. Try your combinations. Trust me you will also agree with my thought that philosophy is the mother of all thought and vice-versa. Must say, the tech tool itself is no less interesting! Actually shocked... It works for totally irrelevant stuff as well !!! Truth->Fact->Truth... This runs in a loop in Wikipedia.